According to the Russian Navy’s ship charter, it is possible to take animals aboard ships only with the permission of the vessel’s commander. Commanders frequently have no objections, however, so it is common to see the likes of cats among the crews of submarines and surface vessels, though other animals have also been prized by sailors for their various talents. Few people know that there are actually two crews on most of the ships of the Russian Navy: the first consists of seamen and the second of “sea kittens.” Each crew has its own responsibilities: The first controls the ship and its systems, while the second, according to superstitions, brings the ship luck, heralds storms and predicts the weather. 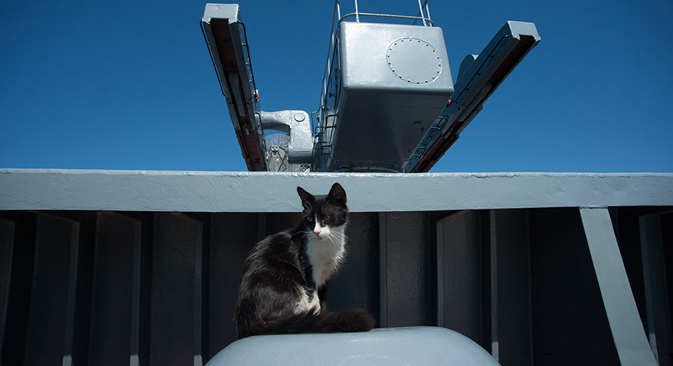 Cats have been serving aboard ships for hundreds of years and are full-fledged members of the crews, receiving awards and medals, and even monuments. Since time immemorial cats have been an essential part of any ship. The number of sea kittens is usually limited by the size of the ship. For example, on the Russian aircraft carrier Admiral Kuznetsov it is impossible to determine their number, while on the small antisubmarine ship Onega there is only one sea kitten. The most famous Russian Navy feline is a cat by the name of Botsman, who is serving on the nuclear-powered cruiser Kirov (Project 1144). He carries out all the commander's orders irreproachably, undergoing enhanced training with the help of a laser pointer on a regular basis. He has several furry mariners under his supervision who have their own responsibilities: Some are on duty by the gangway, memorizing the faces of those walking by, others serve by the large mess room, attentively studying those entering. As a reward for good service, Botsman is allowed to take a walk in the Zvezdochka shipyard at Severodvinsk, in the Arkhangelsk region. But cats also live in submarines. They do not catch rats there, since submarines do not have rats. However, they serve as an excellent means of relaxation for the seamen. Their purring and graceful movements have a calming effect. Also, the crews say that cats in a submarine are better than any gas detector. A cat from the TK-13 Project 941 submarine, which was awaiting dispatch on a mission, would reportedly come to the central post for his watch every day at 20:00 carrying a dead rat, deposit it by the orderly's chair and leave. Of all the creatures kept aboard Russian ships, cats occupy a special place, though other animals such as dogs, birds, rats and even bears have been known to keep mariners company. Rats are a headache for captains who do not like cats. If there are no cats there are rats. But there are also good domestic rats, like Larisa from the Project 58 missile carrier Admiral Golovko, who became the darling of the vessel’s crew. The ship no longer exists, but everyone from its crew remembers her story. In the 1970s the cruiser's first mate befriended one of the vessel's rats, named it Larisa and took it to live with him in his cabin. He taught it to greet him every time he entered by jumping on his shoulder. Larisa lived in the cabin for a long time and the other crewmates always brought it goodies in the evening. One day the ship underwent an inspection and one of the inspectors looked inside the cabin. The rat jumped on his shoulder and the inspector nearly died from the shock. A scandal erupted and Larisa was forced to go ashore and live in the first mate's house. It is difficult to believe but until the 1950s there were even bears in the navy – a tradition which had existed from the pre-revolutionary era. Since time immemorial the bear has always embodied Russia's spirit and power. At first glance the animal is peaceful, even indolent, but it is also capable of quickly changing its attitude and tearing to pieces anyone who threatens it. Moreover, domesticated bears lived near people for long periods, performing various tricks, becoming the favorites of entire regiments and ships. After the revolution many traditions were forgotten, but the custom of having a talisman aboard a ship was preserved. The tradition of keeping a bear on the ship is now a thing of the past, however, and the club-footed creatures no longer go aboard.